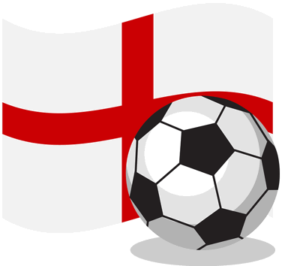 The English football league is the healthiest in the world, no other countries boast as many professional clubs as England do and no other nations watch as much lower tier football as the English either. Combined with the breath of history and fierce rivalries it produces one of the most exciting football structures in the world. The Premier League may be the richest football league in the world (4th richest of all types of sports leagues) but it may surprise many that the English Championship is 10th on that list (18th of all sports leagues), drawing more revenue and bigger crowds that the likes of the Dutch Eredivisie and the Russian Premier League. League One is 28th richest, ahead of the Scottish Premiership, for example, and League Two the 38th richest in the world, ahead of the likes of the Ukrainian Premier League. In terms of betting more money is staked on the Championship, League One and League Two than is bet on all other major European leagues combined. 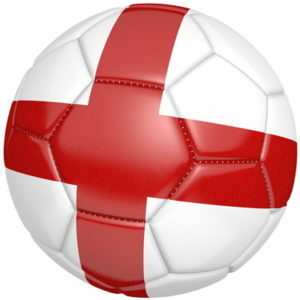 Therefore lower-level football in England is a big deal for the bookies, and this means of course it is competitive and when we have competition we have lower margins and valuable promotions to encourage you to bet. Whether you place a weekly acca or always back your team to win you might as well take advantage of these offers, which can add serious value over a 46 game season. 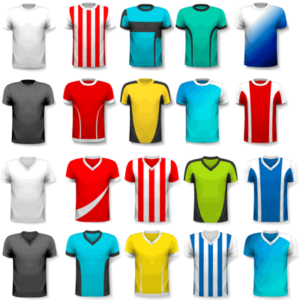 On this page we cover the latest and best deals throughout the English football league season, further down you can find more information and trivia about English football. 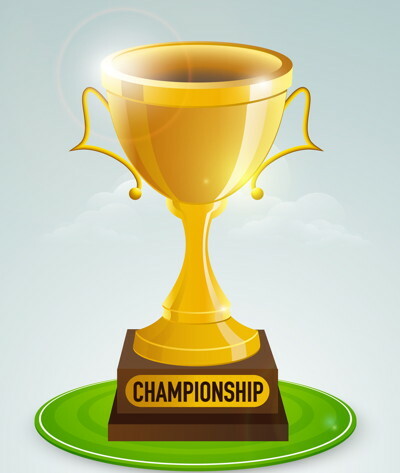 Visit our blog for advance new season betting tips for champions and relegation. The promotions listed below are for all customers, however if you are a new customer with a betting site you can take advantage of high value introductory sign up offers and bonuses, see a list of these by visiting our free bets page. Football is played pretty much weekly during the season. Those that bet regularly might want to consider the various free bet clubs, loyalty points and other retention offers available to add longer term value to their bets. Accumulators are made for footy with more offers available now than ever, from insurance to bonuses to free bets. If you place multiples you might as well take an offer to increase potential winnings. The Premier League is one of the most watched football divisions in the world and considered to be the pinnacle of the English game. Ask anyone from Spain to Bermuda, Germany to the United States to tell you about football in the UK and they’ll almost certainly reel off a list of names of clubs and players that call the Premier League their home. Yet the current top-flight is a relatively recent phenomenon when you consider that league football in England has been taking place in an organised fashion since the 1880s. The Premier League unquestionably has its basis in the original top-flight, but it’s the Football League that can truly trace its lineage back to that first league that was setup in 1888. 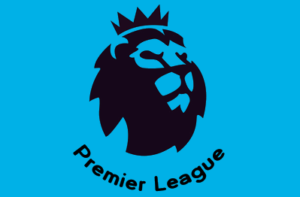 The Premier League is actually a separate and distinct entity from the Football League, as we’ll explore in more detail in this piece. 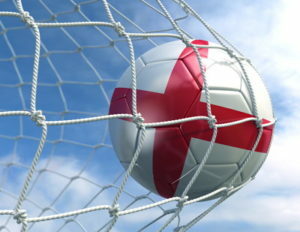 Though the English game is often referred to as involving ninety-two teams, it’s more relevant to think of it as more like one set of seventy-two and another of twenty. What confuses the matter slightly is that the ‘English Football League’ is both the combined name of the three divisions that make up the rest of the competition outside of the Premier League and the name of the governing body responsible for two of the country’s knockout competitions. That some people might not realise that there’s a distinction between the country’s top-flight and the divisions that come below means that there’s plenty that can be said about the Football League, so this is where we’ll say it. The pinnacle of the football league is to achieve promotion. Let’s loom at how the play-offs work that see teams move between the different divisions. They are the culmination of a league’s season and are seen as being one of the most exciting moments of the campaign. In the EFL Championship and League One, the sides that finish first and second gain automatic promotion to the league above them, replacing the teams that finished eighteenth and nineteenth and that have been relegated. Clubs that ended the season third, fourth, fifth and sixth in the league then enter the play-offs to decide who will take the third promotion place. The system works by pitting the club that finished third playing the side that finished sixth and the team that came fourth playing the one that ended the season in fifth. They play two games, one home and one away, with the team that wins heading to the play-off final. If scores are level at the end of the second match then extra-time and penalties can be used to decide the winner. The victors in the two play-offs enter to the final and go head-to-head to decide which of them will play in the higher tier in the next campaign. Things work slightly different in the EFL League Two, simply because the division has more promotion places available to it than either of those above. At the end of a league season, four clubs are relegated down to League Two from League One, with three of them replaced by the top three teams from League Two. The fourth place is taken up by the team that wins the League Two play-offs. The overall format of the League Two play-offs remains the same as it is for the Championship and League One, with the difference being which position in the league clubs need to finish in order to take part in it. The team that finishes fourth plays against the one that ends the season in seventh, whilst the club coming fifth goes up against the one that finishes sixth. Once again, the semi-finals take place over two legs and the winners, after extra-time and penalties if necessary, play in the final. Interestingly, the EFL Championship Trophy shares the same design as that which was presented to winners of the old First Division. The competition might have undergone a rebrand but the trophy itself remains the same. That makes it one of the oldest trophies in football, given that it was first presented in 1891. It is nicknamed ‘The Lady’ on account of the fact that there is a lady on top of the trophy holding what appears to be a ring. The trophy was designed and created by a company called Vaughton’s in Birmingham – the same company that continues to make the Football League winners’ medals today. 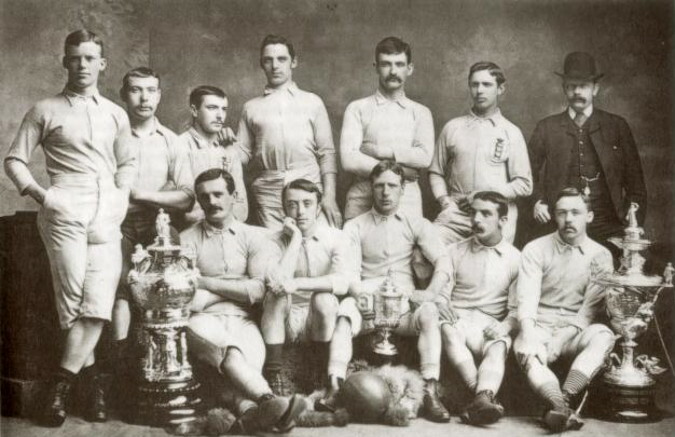 Everton were the first club ever to lift the trophy when they won the 1890-1891 First Division title. The front of the trophy features an engraving of the twelve founding members of The Football League committee. The back of it shows a football match being played, with a net noticeably missing as they weren’t invented at the time that the trophy was made. League One and League Two have the same style trophy to lift, created by Thomas Lyte on a commission from the league sponsors when the company took over the sponsorship duties of the English Football League. They are silver plated and have gold plating on their handles, standing seventy centimetres tall. The runners-up also get a trophy, though it only has two handles rather than the three on the trophy presented to the champions. The play-offs are seen as being just as worthy of a trophy as the main event, so Thomas Lyte made one of them, too. They boast the same design as the trophy presented to the champions, with the differences being that they’re silver-plated and stand at just seventy centimetres in height. Even though Thomas Lyte were commissioned with designed new trophies, they felt that the ones that were already being used boasted a degree of prestige that would be tough to replace. As a result, they kept the design but rebranded them with the sponsor’s logo. 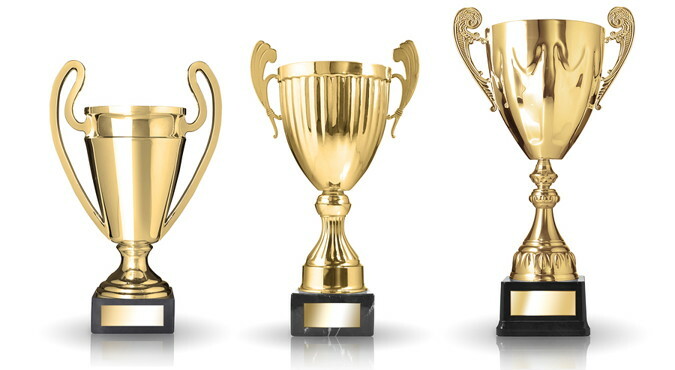 All winning clubs receive their own replicas of the trophies. In terms of prize money alone, the EFL Championship doesn’t come close to the amount of money that Premier League winners get. Equally, the money that League One winners pale in comparison to the Championship winners and likewise between the League Two and League One victors. The big difference between the Premier League and the divisions below it in the English system is that the top-flight gives an amount of prize money out depending on where in the league the each team finishes. The Championship, on the other hand, gives out an equal amount of money from its TV deal to every team. In 2017-2018, for example, the EFL Championship paid every side £2.3 million, whilst they all also received a £4.3 million Solidarity Payment. That is paid to the EFL by the Premier League to ensure that the gap between the top-flight and the second tier doesn’t grow too big. Teams in the EFL Championship do receive a payment every time they appear in a televised match, with the home side being paid £100,000 if they’re at home on a Saturday, £120,000 if it’s a Sunday and £140,000 if the match is held on a Thursday. All away teams, meanwhile, are paid £10,000. In the 2017-2018 season the eventual winners Wolverhampton Wanderers, who appeared on TV thirteen times, banked £7.4 million in total. It’s not dissimilar in League One in terms of what the teams receive money for, getting a basic award of £732,000 and a Solidarity Payment of £675,000. It’s £30,000 if they’re on TV and £10,000 if they’re an away side whose game is televised. As mentioned above, the drop off to League Two is then greater again. In 2016-2017 each League Two team was paid a basic amount of £472,000, which was about £200,000 less than League One, and a Solidarity Payment of £430,000 rather than £645,000 paid to the division above them. The so called ‘Parachute Payments’ that clubs relegated out of the Premier League receive are designed to soften the blow of relegation of the teams that go down. The prize money paid to teams in the Premier League is considerably more than that earned by the leagues below it, meaning that it can be financial painful to drop out of the lucrative top-flight. Teams receive an amount of money split over several years, with the hope being that the payments will stop clubs from getting into immense difficulties with their finances as the likes of Leeds United have in years gone by. If a team gets relegated after just one year in the Premier League then they only receive one year’s worth of parachute payments rather than two. 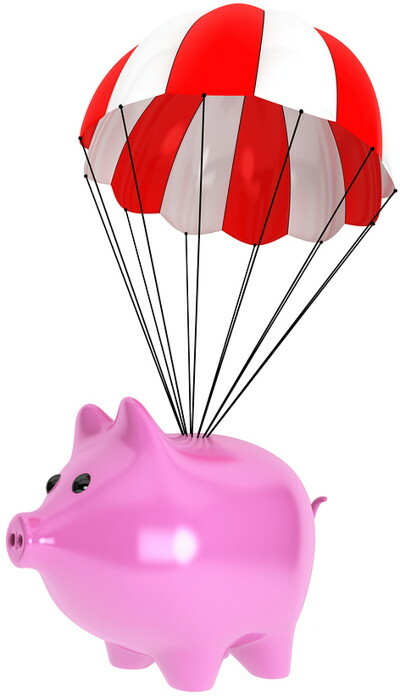 There are many who are critical of the parachute payments system. They believe that it allows teams that have been promoted and already been paid a lot of money simply by being in the Premier League to receive even more money, making it increasingly difficult for those sides that have never even been in the top-flight to get there in the first place. The Premier League and English Football League have worked together to stop that from being the case, trying to be fair for all teams involved. Don’t be surprised, therefore, if they change the system again before too long. The table above shows winner since the format change in 1992/93 when the Premier League began. There is some crossover between the history of the Football League and the history of the English top-flight, so do make sure that you have a look at our Premier League piece in order to get the context of how football in England has been formed over the years. When football was first formed as a sport, it was generally considered to be an amateur venture. 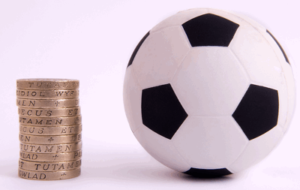 Clubs often paid the best players money in order to convince them to play for them, but that went against the Football Association’s rules and so a debate ensued for years around the idea of football clubs becoming professional. The sides that obeyed the FA’s rules and refused to pay players to turn out for them in matches felt cheated by the clubs that broke the rules. In spite of that, the bigger clubs kept on doing it and the debate raged on. It grew to the point that the FA had to do something about it if they were hoping to maintain their tentative grip on the organisation of the burgeoning sport, so on the 20th of July 1885 it was decided that professionalism would finally be allowed. As a result, more and more clubs started to turn professional as the months went by and it was soon decided that the somewhat ad-hoc manner of organising fixtures wasn’t good enough for raising an income that was necessary for professional clubs to keep paying their players. The fixtures were made up of the likes of FA Cup games and inter-county matches, so something more regular and permanent was sought. It was a man named William McGregor who came up with the idea of something that would later blossom into being a league. He was one of the directors of Aston Villa Football Club and in March of 1888 wrote to the club’s committee, as well as the committees of Blackburn Rovers, Bolton Wanderers, Preston North End, Stoke and West Bromwich Albion, putting forward the idea of a league that would offer a given number of guaranteed fixtures that the members of the league would play each year. On the eve of the 1888 FA Cup final, representatives from each of the clubs met in a hotel in London and began discussions about what sort of format this league would take. They met again in April at a hotel in Manchester and McGregor suggested that the new venture should be called the ‘Association Football Union’. It was felt by many that that was too closely linked to the ‘Rugby Football Union’ and instead a man from Preston named Major William Sudell proposed an alternative name of the ‘Football League’. This was accepted by everyone and the new league was officially ratified on the 17th of April 1888. The first version of the Football League began on the 8th of September 1888, with twelve clubs being involved shown in the table above. The more eagle-eyed amongst you will realise that the clubs involved in the league in those early days were all based in the North and the Midlands, with Southern clubs not wanting to be involved, primarily because of the travel involved. The league was dominated by Preston North End and Aston Villa in the early years, with Sunderland also successful in it after Stoke City were not re-elected to it in 1890 and the North East side replaced them. They were re-elected in 1891 and they joined Darwen in swelling the division to fourteen teams. One thing that’s often ignored when people discuss the Football League is the fact that it wasn’t the only league that was formed in the sport’s more formative years. In 1889 twelve other clubs, also from the Midlands and the North, formed the Football Alliance. It came off the back of another attempt to create a league called the The Combination, but that was unsuccessful to the point of being wound down before it was even completed. The clubs that made up the Football Alliance in its first season are shown in the table above. 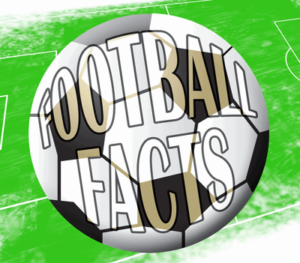 In 1892 it was decided that having two rival leagues was doing English football no favours, and so the Football Alliance was absorbed into the Football League as its Second Division. Nottingham Forest, The Wednesday and Newton Heath went into the top-flight, whilst Darwen dropped out of it and back into what used to be the Football Alliance. 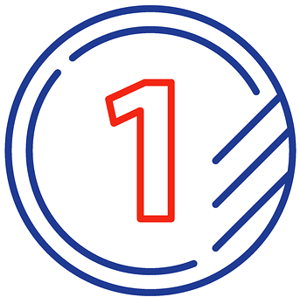 That meant that the the top-flight, which was renamed as the First Division, had sixteen clubs and the new Second Division began life with twelve. An informal system of promotion and relegation between the two divisions was introduced immediately, but not every club was happy with it. When Accrington was relegated at the end of the first season, for example, club officials chose to resign from the Football League entirely rather than play in the Second Division. The Southern clubs didn’t really get involved until the start of the twentieth century, with the likes of Chelsea, Clapton Orient, Fulham and Tottenham Hotspur joining between 1905 and 1908. The First World War saw the first occasion that the Football League was suspended since it had been formed, with four seasons failing to take place. It got back underway in 1919 and the year after a Third Division was added. This mainly consisted of teams from the Southern League and in 1921 it was split in two. One half was the Third Division South and the other was the Third Division North. The top club from each side of the Third Division was promoted to the Second Division, whilst two clubs were relegated out of it and entered the league that was most appropriate for them depending on their geographical location. In 1939 the League underwent its second suspension, with play halting until 1946. 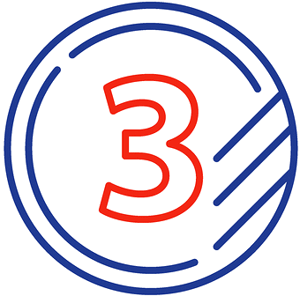 After it resumed, both halves of the Third Division were expanded to involved twenty-four clubs and the Football League had ninety-two sides competing in it for the first time. In 1958, eight years after that expansion, the idea of splitting the league into two halves that were region dependent was abandoned. Instead, a Fourth Division was introduced and it was decided that four clubs would be promoted and relegated between the Football League’s bottom two divisions. It remained the case that two clubs would move between the top divisions, until it was decided that that should be increased to three in 1974. There were numerous alterations to the way that the Football League operated in the decades that followed the introduction of the Fourth Division. Moments such as the introduction of the white football in 1951, the first game played under floodlights in 1956 and the introduction of substitutes in 1965 might all seem fairly obvious nowadays, but they were revolutionary when they happened. Perhaps the biggest alteration came when the Football League Cup was introduced in 1960, but we’ll look at that in more details elsewhere on the site. The 1970s saw something of a revolution in football with the introduction of Sunday matches. Millwall and Fulham were the first teams to play one, playing a hame on the 24th of January at 11.30 in the morning. They were both Second Division sides, whilst Chelsea played against Stoke the following week and were the first top-flight sides to play on a Sunday. 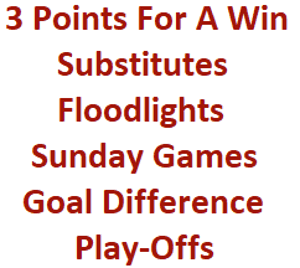 The 1970s also saw goal difference introduced as a manner to separate teams that finished the season on level points, having previously been goal average. Another massive change came in 1981 when the Football League chose to encourage attacking football by awarding three points for a win rather than the two that had been in place for decades. It remained one point for a draw. Hooliganism began to become more prevalent throughout the 1980s, which resulted in fewer supporters attending matches. That was also the result of a recession in the country at the time, which left many football fans with less disposable income. In 1986 the idea of Play-Offs was introduced, resulting in the season being ‘alive’ for more clubs later into the season. It was also used as a method of changing the number of clubs in the different leagues. That changed again at the start of the 1990s, with confusion reigning over how many clubs should be in each division. It was during this time that the Premier League began to come into focus, including the signing of the Founder Members Agreement in 1991 that agreed the basic principles for a new top-flight. The Premier League was the result of a decision from all of the top clubs to resign form the Football League as one during the 1991-1992 season. The Premier League would be operated as its own division, whilst the Football League would operate the other three leagues. No other format change occurred at that time, including the number of teams that played in each division. In fact, nothing much at all changed until the Premier League decided to cut the number of teams that participated in it from twenty-two to twenty in 1995. That resulted in the Football League being for seventy-two clubs rather than seventy. The widening gap in financial might between the new top-flight and the Football League meant that clubs found it ever more difficult to gain promotion to the Premier League and stay there. This, in turn, let to some Football League clubs hitting financial trouble. The likes of Oxford United, Sheffield Wednesday, Portsmouth and Bradford City had issues after their relegation from the Premier League, which resulted in the introduction of Parachute Payments to make the transition easier. Finding the balance wasn’t easy, however, as the clubs that received these payments then made it back up to the top-flight much easier than clubs that hadn’t made it there and never received such payments. It was decided that the Football League needed a re-brand to make it as appealing as the Premier League. In 2004 that re-branding took shape in the form of the different divisions being given new names. 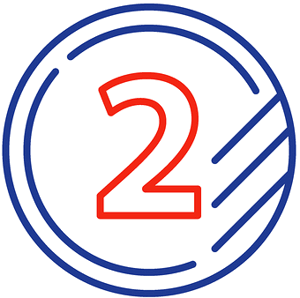 The First Division became the Football League Championship, the Second Division was now Football League One and the Third Division became the Football League Two. It was also decided that Coca-Cola would become the new principle sponsor instead of Nationwide Building Society. That, of course, was after the Second Division had become the First Division in the wake of the creation of the Premier League and all other Divisions shifting up a number in their titles. The re-brand lasted for about eleven years and then another change took place. In November of 2015 the Football League confirmed that it would become the English Football League and that the abbreviation ‘EFL’ would be used. The new branding would be in use from the 2016-2017 season.